The best time to prune most deciduous trees is in winter, this is true for a variety of reasons, it is easier to see the branches when the leaves are gone, the cuts can heal better, there is lower insect and disease levels so there is a lower risk of infection. However the biggest reason is that you’re saving the tree’s energy. Deciduous trees store their energy, their food, in sap, which during the warm months is up among the limbs and leaves feeding new growth. When temperatures drop the trees send the sap down into their roots for winter storage. This is how we can get maple syrup from tapping trees, during transitional weather the sap goes down into the roots at night when it gets cold, and then flows up into the tree during warmer days, and it is this flow that maple syrup producers intercept. So when you prune a deciduous tree during active growing time you’re taking not only the limb, but all the sap stored within it, and that stresses the tree more, like a human losing blood, the tree is anemic for lack of a better word. By waiting until winter when all the sap is stored in the roots you don’t impact the trees health nearly as much, and when spring comes and the tree sends the sap back up and finds it has fewer limbs to feed, that sap will go to fuel an extra large burst of new spring growth. I recently pruned my bald cypress, the very best time to prune is late winter but I did it now because I was worried I would forget. Bald cypress, remember, despite being a conifer, is deciduous, one of the few (lovely) deciduous conifers. I’m limbing it up to provide more sunlight to the strawberries I have planted beneath it, but also to show off the trunk, which is one of the most attractive features of the tree as it ages. By pruning it now, I’m making sure I’m providing it all the fuel it needs to get bigger (taller, thicker trunk) come spring, which is my ultimate goal. Evergreen trees are different, if you want to maintain the shape of the tree pruning needs to be done specifically to the new growth in mid summer, but if you’re doing more severe pruning, such as limbing up, that can be done in winter as well. Fruiting trees have special considerations for maximizing fruit production, though generally also are best pruned in winter, the same with flowering trees. Thanks for giving me that nudge to get my trees pruned. I usually have it done around my birthday, so I had best get on the ball and start getting estimates. I have a very large, very old olive tree. 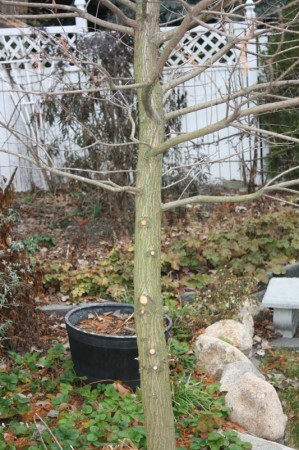 Do you recommend winter pruning? Don’t know if you’d call it a fruit tree or not…. One exception to think about: hard winter areas. In my zone I have to worry about winter-kill every season. I often wait to early spring to prune, because if I do major pruning on a tree it may make it weak; moreover snows and wind may break some percentage of the branches and I like to know which ones these might be before committing to a cut. Good read and reminder of the purpose of pruning that time of the year! Thanks! We’ve had good results too with late fall and winter pruning, especially our conifers and evergreen shrubs. thanks for the great article! we all need helpful info like this. MAPLES – Maples trimmed at certain times of the year will “bleed” or drip from the pruning cuts. Bleeding is most likely to occur when Maples are prunied in the seasons just before and right after winter. Studies indicate that “bleeding” doesn’t hurt the tree, so it becomes more of a cosmetic issue. If you want to prune Maples without bleeding, it must be pruned when it is fully dormant in the middle of winter, or during late spring or summer when it’s in full leaf. DOGWOODS – If you trim Dogwoods in April or May, it will make them more susceptible to the dogwood borer. This insect severely damages the vascular system of the tree after boring into the trunk. OAKS – Oaks should be not be trimmed from April thru October, due to the prevalence of Oak Wilt disease pathogens during that time frame. My tree’s are shade tree’s one is called a Tree of heaven and several are the ones with beans on them and a few more from arbor day we ordered and planted which we dont even know what they are , so i should prune them now in january ? please let me know thx so much everyone . When is the best time to trim a magnolia tree? I want to keep the branches away from our roof? Flowering trees are often best pruned immediately after flowering if you do not want to inhibit next year’s flowers. Otherwise, late winter works for them too if you don’t mind lessening your flower show.